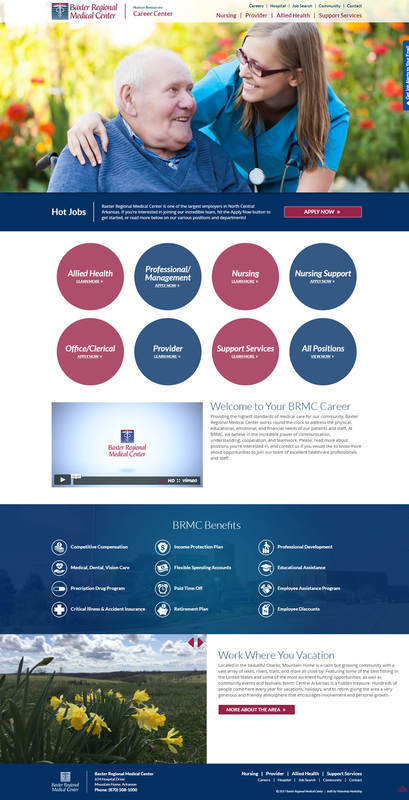 We worked with the Baxter Regional Medical Center Human Resources team to create a sophisticated, mobile-friendly website for those seeking employment with Baxter Regional. The new website includes an easy navigation menu at the top to make it easy for visitors to quickly find the area of employment they are searching. Each area was given its own page with video, detailed descriptions, and a button to “Apply Now.” The new site makes it easier to find jobs and apply online with just a few clicks. Baxter Regional Medical Center (BRMC), located in Mountain Home, Arkansas, serves patients from a two-state, 14-county area throughout north-central Arkansas and south-central Missouri. With numerous patient satisfaction awards, Baxter Regional is committed to providing excellent care for every patient, every time and preserving BRMC as a comprehensive, independent, community-driven health system in order to optimize access to quality healthcare for patients in the communities we serve.